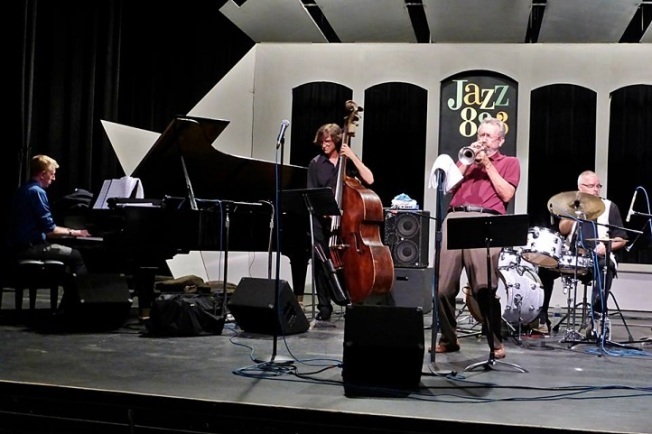 Veteran trumpeter Carl Saunders made the long trek down the Interstate 5 from L.A. on Aug. 4 to star in the latest installment of Jazz Live, the flagship program of KSDS Jazz 88, which has been delighting local music lovers since its inception in the late 1970s. Saunders cut his teeth with the Stan Kenton Orchestra right out of high school and has also held high-profile gigs with Buddy Rich and the Bill Holman Orchestra, where he continues to hold the lead-trumpet chair to this day. Fronting an ace band of local heroes at the Saville Theatre, including pianist Ed Kornhauser, drummer Duncan Moore, and the criminally under-sung bassist Glen Fisher, the Saunders modus operandi was clear from the opening notes of “I Thought About You,” on which his high-wire velocity and piercing upper register set the stage for expansive essays from Kornhauser, Fisher and, especially, Moore, whose joyful swing remains one of the greatest perks of living in San Diego. Kornhauser has quietly become one of our town’s most compelling pianists, and on the Saunders original “Autumn Sojourn,” his light, propulsive groove basically stole the show -- although the way the trumpeter darted through the changes had its own distinct appeal. Fisher led off “Blues for the Common Man” with slurring, fluid double-stops, followed by Saunders’ multistrike blasts into the ether and Kornhauser’s startling distillation of the iconic Red Garland; but once again, it was Moore who brought the house down with his singular, wicked groove. Saunders set down his trumpet and picked up the microphone to intone his comically oriented “You’re Just So Cute,” which featured long, twisted scatting that was either thrilling or tortuous, depending upon your perspective. Alas, I found the latter to be more in line with my personal tastes, but the audience seemed to be convinced – and that, ultimately, is what matters. Robert Bush is a freelance jazz writer who has been exploring the San Diego improvised music scene for more than 30 years. Follow him on Twitter @robertbushjazz. Visit The World According to Rob.